The hemmer foot is one of many called by that name. There are hemmer feet that are narrow hemmers and rolled hemmers, in this case we are speaking of the narrow hemmer. 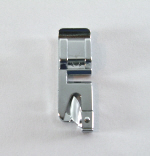 The narrow hemmer is a foot that comes in many widths, some of which are 1/8”, 3/8”, 5/8”, 7/8”, and 1/4", ¾”, 1/2 “, and 1”. The narrow hemmer is used to sew a hem in a fabric that has been folded over twice and stitched flat using a straight stitch, which is all that is required for a flat, basic narrow hem. The foot gives what can be a delicate hem a professional look. The hemmer, regardless of manufacturer has basically the same structure, on the top of the foot there is a curved area that folds the fabric edge, and a toe area to guide the outer edge of the hem, on the bottom of the foot, there is a groove. There are limitations to using this foot, the mechanism that makes the fold is limited on this foot is a rigid one, which limits that thickness of the fabric that can possibly be hemmed, making it possible to only hem light to medium weight woven fabrics.